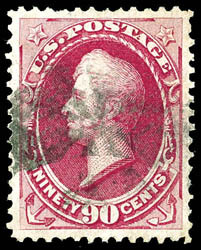 1870, 30¢ black, H. grill, red NYFM cancellation, wide gutter margin at left showing portion of guide arrow at top, large margins around, deep color, Extremely Fine, a choice position single of the rare 1870 30¢ black H. grill issue; with 1990 P.F. certificate. 1870, 90¢ carmine, H. grill, geometric cork cancel, rich bright color, beautifully centered amid well balanced margins, Extremely Fine; with 2015 P.F. certificate. 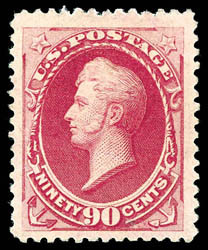 A VERY SCARCE SOUND EXAMPLE OF THE 1870 90¢ H GRILL ISSUE IN EXCEPTIONAL CONDITION. 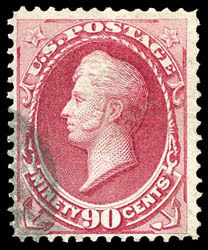 1870, 90¢ carmine, double grill, clearly showing two distinct grill impressions, neat corner cork cancel, rich vibrant color, F.-V.F., an extremely rare 1870 National Banknote grill issue variety, variety listed but yet to be priced in Scott; with 2002 P.F. certificate. Scott No. 144 var. ; $2,500 for normal Estimate $2,500 - 3,500. THE ONLY RECORDED EXAMPLE OF THE 1870 90¢ NATIONAL BANKNOTE DOUBLE GRILL VARIETY. 1870, 3¢ green, on 1870, 3¢ green entire to Orrville, O., tied by clear strike of "Cincinnati. O. Sep 13" Gaston Patent Cancel blue oval cancel with illustrated ad for Monitor Cooking Stoves showing the U.S.S. Monitor; trivial stain at lower left, Very Fine. Scott No. 147 Estimate $750 - 1,000. ONE OF ONLY A FEW RECORDED EXAMPLES OF THE CINCINNATI OHIO GASTON PATENT. 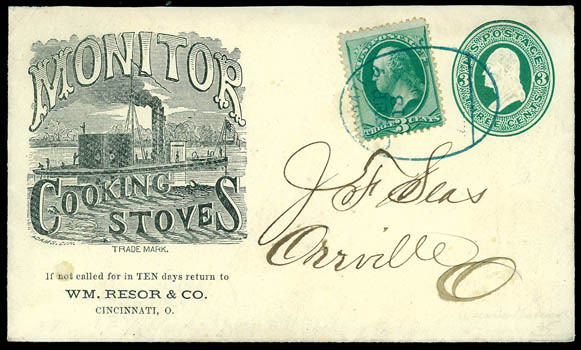 During the Fall of 1871, postmarks produced by a patented handstamper invented by J.C. Gaston was tested for a few weeks each in Cincinnati, Columbus and Cleveland. The bar across the end of the large oval marking was comprised of a line of tiny pins, intended only to penetrated through the stamp and not damage the letter content. According to Cole, the marking was used successively in Cincinnati (Sep. 6th to Sep. 14th), Columbus (Sep. 27th to Oct. 2nd) and Cleveland (Oct. 4th to Oct. 7th). 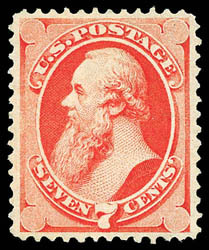 1871, 7¢ vermilion, o.g., lightly hinged, perfect centering amid nicely balanced margins, rich radiant color and particularly fresh, Extremely Fine, undergraded in our opinion and rare so nice, even so with only three o.g. examples to grade as such with only three higher; with 2014 P.S.E. 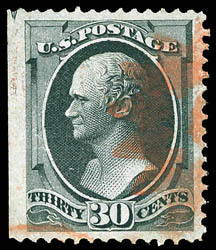 Graded certificate (VF-XF 85, SMQ $2,000). 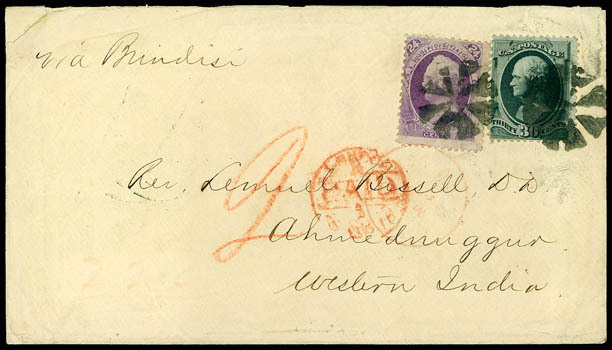 1870, 24¢ purple, used with 30¢ gray black (165), tied by matching circle of wedges fancy cancels and 24¢ by indistinct red "Boston Paid Aug 24" exchange cds on 1875 cover from the Bissell correspondence to Ahmednuggur, India, light red crayon "220 / 2" for 44¢ double-weight credit to G.B., red London Paid (0.9.75) transit cds and large red crayon "2" for double-weight colonial credit, reverse with Sea Post Office (9.17) and Ahmednuggur (10.1) backstamps; upper left corner tear, still a Very Fine use at double the 27¢ rate to India; with 1998 A.P.S. certificate. Scott No. 153 Estimate $1,000 - 1,500. 1873, 6¢ dull pink, strip of four, tied by radial geometric fancy cancels on 1877 folded cover to New Zealand at double the 12¢ treaty rate, magenta "San Francisco Cal. 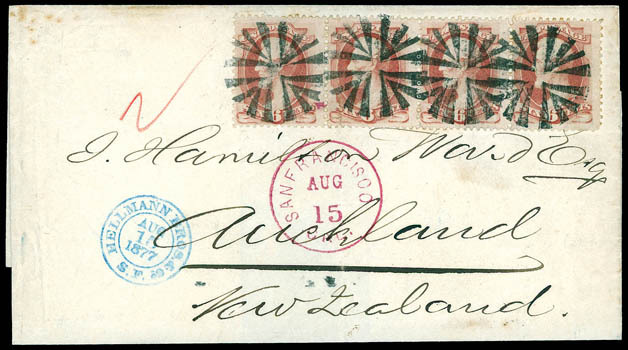 Aug 15" cds, red crayon "2" for double weight, Auckland (9.7.77) arrival backstamp; second stamp affected by vertical file fold, Very Fine, ex-Klein, Landau. Scott No. 159 Estimate $2,000 - 3,000. A BEAUTIFUL USE WITH FANCY CANCELS TO AUCKLAND, NEW ZEALAND. 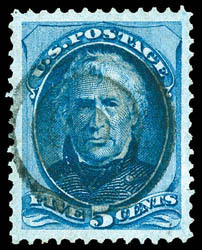 1875, 5¢ blue, target cancel, precision centering amid uncommonly large margins, rich intense color and detailed impression, a Superb jumbo gem, rarely encountered so choice; with 2015 P.S.A.G. Graded certificate (98J, SSV $850 for 98). 1879, 90¢ carmine, full o.g., fairly light hinging, remarkably large margins, rich radiant color and fresh bright paper, a Very Fine to Extremely Fine jumbo, rarely encountered so large; with 2015 P.F. certificate. 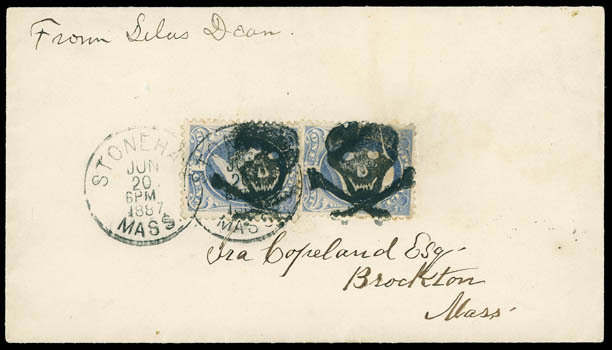 1881, 1¢ gray blue, re-engraved, two singles, affixed at center of cover to Brockton, Mass., tied by two bold strikes of the "Stoneham, Mass., Jun 20, 1887" cds and fancy Skull & Crossbones duplex; right stamp with a trivial hint of toning, Extremely Fine and choice, ex-Judd, Artemis; with 2011 P.F. certificate. Scott No. 206 Estimate $10,000 - 15,000. A MARVELOUS DOUBLE STRIKE OF THE STONEHAM MASS. SKULL & CROSSBONES FANCY CANCELLATION - CONSIDERED TO BE THE FINEST EXAMPLE OF THIS VERY RARE PICTORIAL CANCEL.